Clinical investigations into the machinations and characteristics of asthma, chronic obstructive pulmonary disorder (COPD), and asthma-COPD overlap (ACO) has led at least 1 clinician to theorize the distinctions between the 2 conditions will become antiquated. Rather, Amir A. Zeki, MD, suggested asthma and COPD could eventually be identified in a continuum of obstructive airway disease (OAD). In a presentation at the 2018 CHEST Annual Meeting in San Antonio, TX, Zeki, from the University of California – Davis, proposed new directions by which clinicians can consider the similarities and differences of asthma and COPD. He pointed to the conditions’ key areas of overlap: mixed inflammation, cytokine profiles, airway smooth muscle cell proliferation, hyperinflation and air-trapping, and even iterations of bronchodilator responsiveness and fixed airflow obstruction. “The clinicians seeing these patients really struggle when you have these features, and really, sometimes you can’t determine who truly has asthma and who truly has COPD from a pragmatic standpoint,” Zeki said. That burgeoning question led to some of the most recent clinical trials which address the debate of asthma-COPD disparity. Much of this focus has been turned to ACO, which Zeki distinguished into a pair of recently-established patient sub-phenotypes. The first group, he explained, includes asthmatic patients who smoke, suffer from COPD with eosinophilia or high inflammation, or have COPD that responds very positively to bronchodilator (15% prediction and ³ 400 mL change in FEV1). The second group of ACO patient sub-phenotype is comprised of non-smokers, with severe asthma characterized by incomplete airflow reversibility or fixed obstruction. They could have also had asthma diagnosed from childhood, advancing in adulthood with fixed obstruction, or be obese asthmatics with steroid resistance and fixed airflow obstruction. Zeki emphasized these subtypes are based on recent clinical evaluations, with upfront consideration to patients who do or do not smoke. It may not be feasible to simplify ACO to that extent, and clinical analysis often focuses on patients more similar to the first group. “This designation is certainly not fixed, and needs some significant research to better understand whether this is a way to think about it,” Zeki said. The means by which asthma and COPD are distinguished from one another outside of ACO indication is more well-established. Patients with either condition commonly report different in lung function tests including diffusing capacity of the lungs for carbon monoxide (DLco) and arterial blood gas (ABG) tests. Inflammatory biomarkers, including atopy, fractional nitric oxide (NO) concentration in exhaled breath (FeNO), and blood eosinophilia are generally found at differing metrics across asthma and COPD patients. Even so, Zeki called these potential biomarkers “a little murky,” noting that a primary care physician could likely only definitely rely on FeNO rates to distinguish between the conditions. A study published in the European Respiratory Journal in 2001 first reported elevated FeNO rates in patients with COPD, but even higher rates in patients with untreated asthma. Zeki noted it could serve to promote both a significant overlap between asthma and COPD, as well as for distinguishing either of the pulmonological conditions from health controls. Other trials, including a recent assessment of interleukin-6 (IL-6) inflammation across patients with asthma, COPD, or ACO, found serum IL-6 was highest in patients with ACO as compared to asthma—but not compared to COPD. As ACO tends to be an airway-prevalent condition when compared to COPD, Zeki called the findings one of the most interesting and most relevant to clinicians’ efforts to establish better biomarkers. 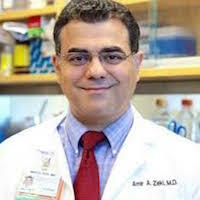 With consideration to improved understanding of pathways and emerging analysis of more specific biomarkers—as well as therapies such as omalizumab and anti-IL-5 agents—Zeki proposed a new hypothetical process for care. Once airflow obstruction is established in a patient, he said, physicians can use sputum, blood eosinophil count, and biomarker characteristics, as well as imaging, to establish the mechanisms causing the individual phenotype. From there, treatable traits could be more accurately identified, and patient symptoms can be addressed—regardless of asthma, COPD, or ACO.